Watchband-hinged 2-in-1. Lenovo's flagship consumer convertible with 13.9-inch screen now comes with Kaby Lake R hardware and a few other noteworthy updates. Our review takes a look how the Yoga 920 compares to other 2-in-1s as far as performance, battery life, and fan noise are concerned. The Yoga 920 isn’t the end-all, be-all best notebook out there. But if you’re after “one of those” kinds of PCs, it’s hard to look past it. It adds up to a stunning machine. Lenovo has tough competition from the Surface Pro in particular, but even at $1,899 the Yoga 920 offers better value than this rival – the screen holds it back from a five-star rating, but this laptop comes warmly recommended. At the end of the day though this is Lenovo’s premium two-in-one ultraportable and for me it lived up to all expectations. It performs great, feels high-end with its aluminum chassis, and watchband hinge is the best out there right now. You can pick up the version we reviewed today (YOGA 920-13IKB 80Y7) for $1299.99 at our favorite online retailer. Overall ThinkComputers gives the Lenovo Yoga 920 2-In-1 Ultrabook a 9 out of 10 score. The YOGA 920 is one of Lenovo’s finest flexible laptops to date and is an excellent choice for someone who needs an ultrabook that packs the latest Intel hardware. The combination of a light weight, excellent display, various hardware options, and an attractive design makes this model a winner. Available from Lenovo now starting at $1,199 USD. 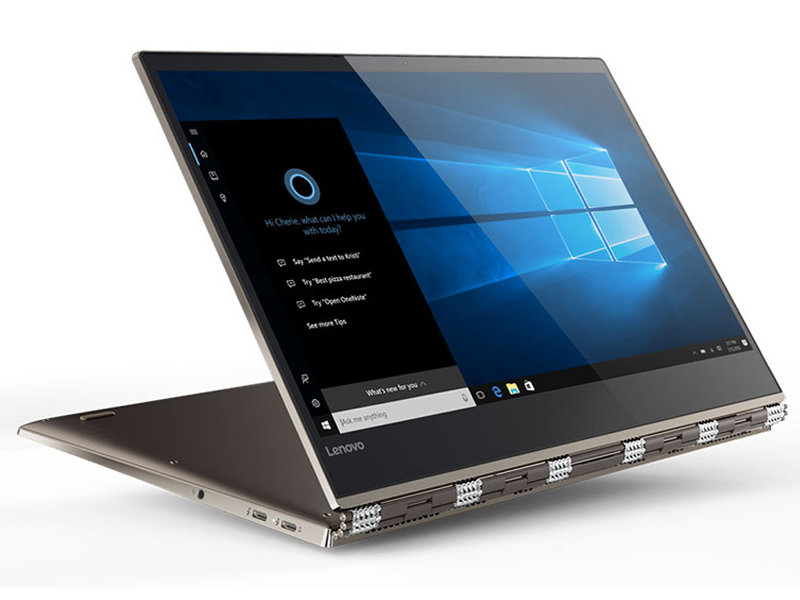 Lenovo’s quad-core, Kaby Lake Refresh-powered Yoga 920 cuts a fine figure as it chews up laptop performance benchmarks, while its long-range Cortana microphones, pen support and on-board Dolby Atmos sweeten an already enticing package. That said, we can think of at least one competing 2-in-1—namely, the HP Spectre x360—that we believe is a better value. The new Lenovo Yoga 920 is elegant and well mannered, both in terms of its performance and presentation. It's understated in some respects, but its classic Lenovo Watchband hinge design adds a touch of glitz and class. This machine has all the horsepower any power user would be looking for in a highly portable and convertible system, and it does so in style. There's also the added utility of the machine's pen and stylus interface, if sketch and annotation input are useful tools to have in your bag. There's stiff competition in this class and form-factor of hybrid ultrabooks, but the Lenovo Yoga 920 is one to keep on your short list for consideration. That about wraps it up. Starting at $1,200, Lenovo's Yoga 920 2-in-1 is not the most affordable ultraportable you will find, but you certainly get what you pay for. The all-metal exterior makes the laptop feel premium on the outside and the internal component selection makes it premium on the inside as well. Although it feels one notch too tight for me, the hinge system is truly the best that money can buy right now. If you're in the market for an ultrabook or 2-in-1 device, it's hard to go wrong with the Yoga 920. If you can live without the bronze color scheme and unique wristband hinge, the New Dell Inspiron 13 7000 2-in-1 is a great alternative. Not only does it have near-identical specs, it's about $300 less than the Yoga 920 (when it's at full price). But if you really love that swanky design and are working with a flexible budget, the Yoga 920 is the best of the best. The Yoga 920’s starting price is $1,329, with our review unit coming in at just under $1,500. If you can live with a less-fashionable design and reduced battery life, the Yoga 720 is a worthwhile alternative for up to a few hundred less. But if you have the coin, the Yoga 920 is a high-end ride. The Lenovo Yoga 920 gets a handful of improvements and added features including a pen-enabled display and eighth-gen Intel processors to make it one of the best premium two-in-ones you can find. With two Thunderbolt 3 ports and two more CPU cores, Lenovo's top consumer convertible becomes even more compelling. And how about that phenomenal battery life? 83.98%: This rating should be considered to be average. This is because the proportion of notebooks which have a higher rating is approximately equal to the proportion which have a lower rating.